The teams of Sri Chaitanya Junior College, Raman Bhavan branch at Rama Talkies bagged the top two spots at the Academic Pentathlon organised by The Hindu, here on Tuesday. Both the teams will now participate in the grand finale which is scheduled to be held at Vignan University at Vadlamudi in Guntur district. The Vignan Residential campus at Timmapuram where the competition was held wore a festive look as hundreds of students gathered there to participate in the Academic Pentathlon. 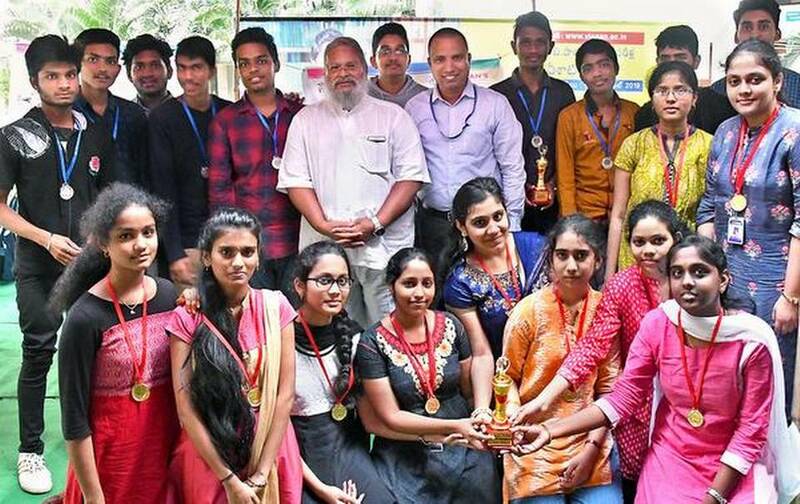 More than 400 students from 25 junior colleges in Visakhapatnam, Vizianagaram and Srikakulam districts took part in the competition organised as part of the regional round of the second edition of The Hindu Academic Pentathlon. The students not only showcased their academic and intelligence skills, but gave vent to their creative side. The event was organised for junior and senior intermediate students. In total, it will be organised at five centres across Andhra Pradesh and Telangana. The winner of all the regional rounds will participate in the grand finale. The regional rounds on Tuesday comprised quiz competition in mathematics, physics and chemistry, apart from English elocution and fine arts. The winners include Sindusha and Srija (mathematics quiz), Aishwarya and Babitha (physics quiz), Sruthi and Shriya (chemistry quiz), Sri Harshini B.V. and Kushmitha (elocution) and N. Jyothika Sanjana and Jaya Harshitha (fine arts). The runners up include Koushik and Chaitanya (mathematics quiz), P. Sai Manohar and G.D. Abhi Ram (physics quiz), Prajwal and Mokshagna (chemistry quiz), Mrunal and Kundan (elocution) and Hemanth Dekka and K. Sravanth (Fine arts). The prizes were given away to the winners by Vignan Deemed to be University executive director Srikanth and rector S.B. Rao. The quiz competition was adjudged by Murali of GIT Solutions. Apart from taking home trophies and medals, the regional winners will also qualify for a scholarship of 10%, if they seek admission in Vignan university. The eligibility criteria are a minimum of 9.33 CGPA for students from Andhra Pradesh and 940 marks for students from Telangana in Intermediate examination. In grand finale, the winners will get 50% scholarship, and second and third winners will get 25% scholarship respectively if they seek admission in Vignan university. Students from Andhra Pradesh with a minimum of 9.50 CGPA and those from Telangana with 940 marks in Intermediate examination are eligible.